Janice Kim 3P, popular go teacher, go blogger, and co-author of the Learn to Play Go book series, will teach a workshop in Berkeley, California this coming weekend, June 23 and 24. Those who signed up early turned in game records for Kim to review before the workshop so that she could tailor the discussion topics specifically to students’ needs. “Course materials and game records will be provided in both print and electronic format so that students can take notes and annotate records on mobile devices or with pen and pencil,” reports organizer Roger Schrag. Seats are still available, and the deadline to sign up is this Friday, June 22 at noon. Class size will be kept small so that everyone can get as much individual attention as possible. Learn more about the workshop and sign up on the workshop web page. Photo: Janice Kim lectures at the 2012 Cotsen Open; photo by Chris Garlock. 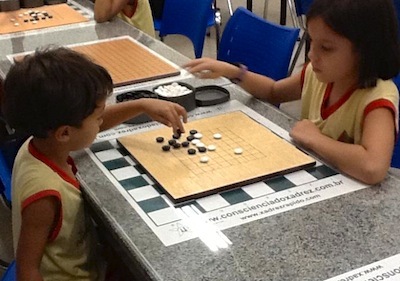 The Caroline Campelo Cruz e Silva School in Palmas City, Brazil, has launched a full go program for kids, reports teacher Luciano Sanches Teixeira. Recent changes in organization and curricula at the school opened up space for new teaching activities, including a room equipped for teaching chess and checkers. 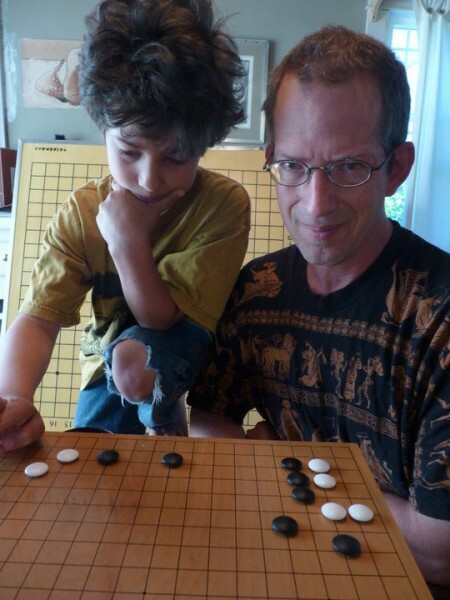 “The first contact with go came about through research about (chess and checkers) on the Internet,” that led to the discovery that “there was another game, an oriental game played with glass spheres on a wooden board,” says Teixeira. 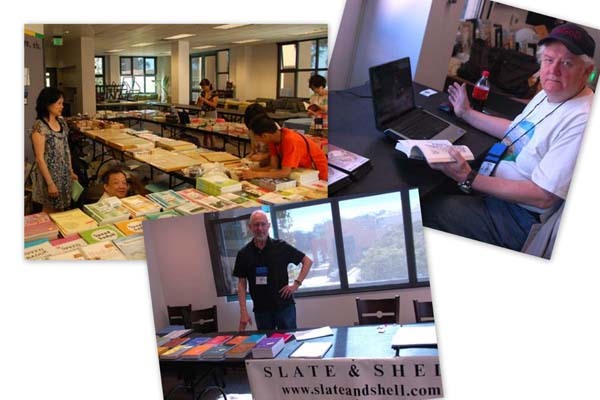 “The AGA Summer Go Camp is excited to announce that both Slate and Shell and Kiseido have made a donation of books to the 2012 camp,” reports Camp Director Amanda Miller. “Throughout the week of July 29, the camp will be holding small tournaments and other fun Go-related activities, such as 13 x13, pair Go, and team tournaments. 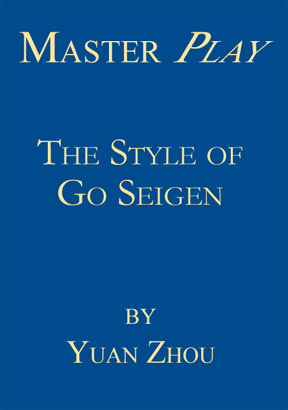 The books will be given out to the winners of these events, and include titles from Yuan Zhou’s Master Play series, Yilun Yang’s The Workshop Lectures, and the Elementary Go Series. Because of the generosity of these companies, there should be more than enough books to go around, so every camper will get at least one,” adds Miller. Go Camp is for anyone between the ages of 8 and 18, and there is still time to register. The camp will take place the week before the Go Congress from July 28 to August 4 and will be held at the same location, the YMCA Blue Ridge Assembly in Black Mountain, North Carolina. Mingjiu Jiang (7P) will be the teacher. Kids who are interested in the camp, but worry they can’t afford it, are encouraged to apply for need-based scholarships, which are still available from the AGF. “We have registered campers between the ages of 6 and 18, and within a strength range of 22-kyu to 1-dan, so the camp should be a lot of fun, regardless of age or rank,” says Miller. For more information, can visit the camp website (www.gocampeast.org) or e-mail the camp directors at agagocampeast@gmail.com. -Paul Barchilon, E-J Youth Editor. 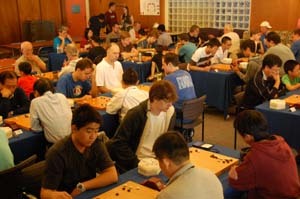 Hundreds of go players gathered in one place. 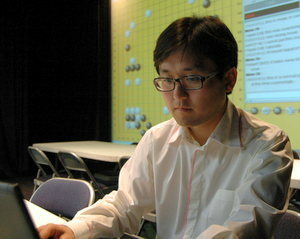 Professionals from around the world playing simultaneous games with amateurs of all strengths. Tournament games daily. Professional lectures and game analysis. Eight days of all kinds of go-related activities from morning to midnight. It’s the annual U.S. Go Congress, of course, and nearly 400 have already signed up for this year’s Congress, which will be held August 4-12 in Black Mountain, NC. 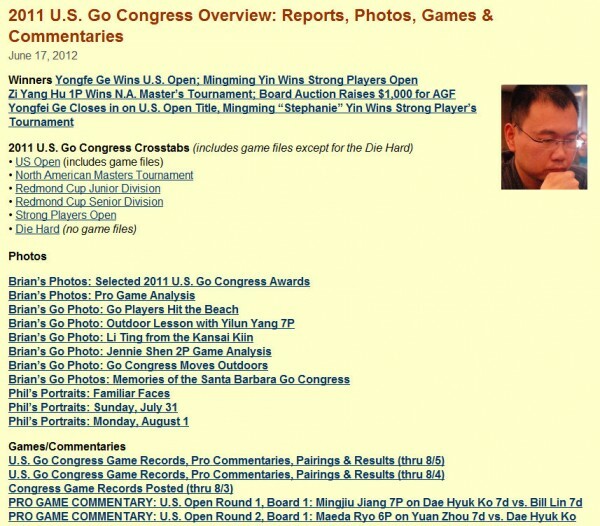 There’s still time to register and to give you a better idea of what to expect, the E-Journal has just released the 2011 U.S. Go Congress Overview, which compiles all our reports, photos, games and commentaries from last year’s Congress in Santa Barbara, CA. 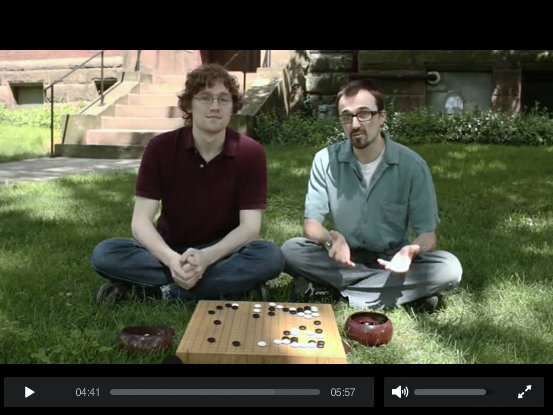 Special features include “Getting Frank with MingJiu Jiang 7P,” “Janice Kim on the 3 Rules of Go,” and a whole lot more, all just a click away. We hope you enjoy this special collection and look forward to seeing you at the Congress! Lightning Tourney: 10m, Sudden Death. Start Your Clocks! 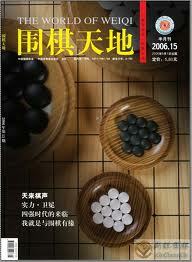 Northern Virginia’s Capital Go Club is making its collection of World of Go (WeiQi TianDi) magazine available free for the asking. 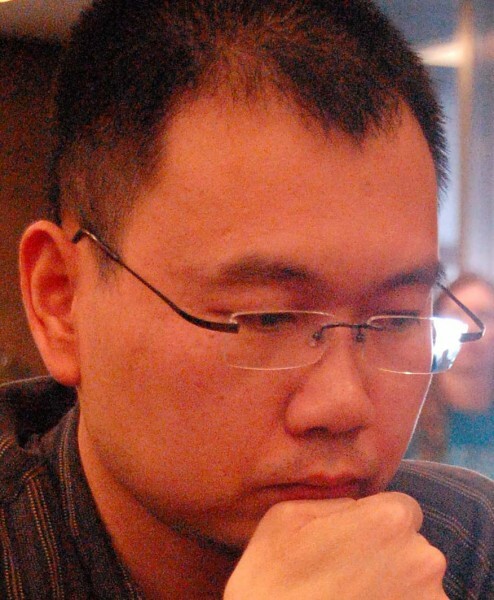 “World of Go is the most popular go magazine in China with hundreds of thousands of readers,” says Capital Go organizer Edward Zhang. The Capital Go Club — an AGA chapter — has a collection of nearly 400 issues of the magazine. 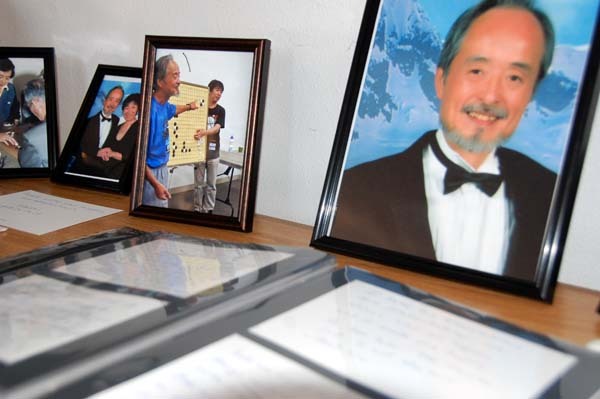 “All you need to do is to fill the registration form and promise to return the magazine in a timely fashion,” says Zhang. While no deposit is required, Zhang does note that the magazine is in simplified Chinese. Due to some technical issues, the American Go Association Go Database (AGADB) is currently offline. The AGA Ratings Database is still online and updated through June 3. We apologize for any inconvenience and will keep you updated about when the AGAGD will be back online. Just a few days remaining before the deadline for nominations in the 2012 AGA Board of Directors election. Nominations are being accepted through June 15; email to elections@usgo.org. Nominated thus far are Lisa Scott in the central region, Gurujeet Khalsa and Zhiyuan [Edward] Zhang in the eastern region, Jie Li and Chuck Robbins for the at-large seat, and Chris Kirschner and Joe Walters for the west. Details on qualifications and procedures are available here.